Use EXCALIBUR® to automatically cut your tie sheets and optimize your palletizing costs. EXCALIBUR® is an automatic tie sheet cutter that is built into your palletizing lines. It improves the operation of your packaging lines and you'll save on paper consumables. By cutting tie sheets directly on the production line, you avoid all sorts of faults on the gripper. The thickness of the paper tie sheet can be adjusted in order to strictly meet the requirements of the pallet. EXCALIBUR® pulls the desired sheet length directly off the roll. The tie sheets are then transported automatically on a conveyor to a designated position. 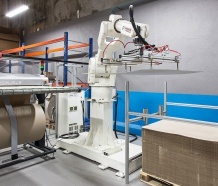 Your palletizer's gripper or your palletizing robot recovers the sheet and inserts it between the rows of products to be palletized. 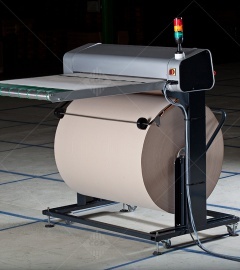 Upon request, EXCALIBUR® unrolls the roll and cuts off another sheet. Thanks to EXCALIBUR®, you produce your slip sheets directly on your premises. The unit can be installed on your packaging line in just half a day. 2 machine formats, 800 mm or 1,200 mm. Equipment proposed for sale and as a ZERO INVESTMENT formula: leasing or made available free of charge. 15 prerecordable cutting length programs. Each machine is guaranteed 500,000 cycles or 1 year. A CE declaration of compliance or integration is provided with each machine. EXCALIBUR® a Plug & Play solution, Plug it in and cut! You receive rolls, loaded horizontally on a pallet. You load the roll, 1 single operation is required, without having to carrying it. You select your pre-recorded cutting program containing up to 15 different dimensions! It's ready Cut your slip sheets! "Save time" option: roll loading trolley. Interface in communicating mode: for PLC control of your packaging line. No difficulty unfolding the slip sheets. No risk of the robot losing the slip sheet. No risk of several slip sheets at a time. - A roll of lightweight paper contains up to 10 times more tie sheets that a pallet of corrugated cardboard tie sheets. - Easy loading of the consumable by a single operator. - Fewer operator interventions required to load consumables. INPUT: Roll width 1,200 mm. OUTPUT: Formats 1,200 x 800 mm (EURO) and 1,200 x 1,000 mm (CHEP / UK). Simplified gripping cycle: the slip sheet is always positioned at the same height. Depending on the type of installation, the operator no longer has to enter the palletizing enclosure to change the consumable. CGP EXPERT is at your service to adapt EXCALIBUR to the configuration of your palletizing lines. Our engineering department takes care of the machine design, assembly and installation. Contact CGP EXPERT for a pre-study of your system.